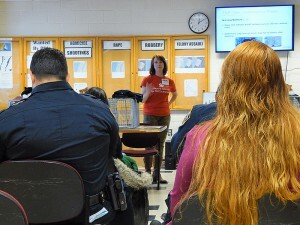 This past spring Kathleen O’Malley and Mike Phillips of the NYC Feral Cat Initiative (NYCFCI), a program of the Mayor’s Alliance for NYC’s Animals, along with Sheila Massey, a Trap-Neuter-Return (TNR) advocate, taught a NYCFCI TNR Certification Workshop to two dozen participants in Washington Heights, eleven of whom were police officers representing seven area precincts. According to Kathleen, “the workshop grew out of the positive relationship built between Sheila and the 33rd Precinct’s Officer Chris Stoll, who is in charge of Community Policing.” Prior to this workshop, Sheila had regularly attended numerous Washington Heights community board meetings. She used these public meetings to inform local police and area residents about community cats and their needs. She addressed meeting participants in a prepared, polite, and concise manner and distributed handouts with basic information about community cats. 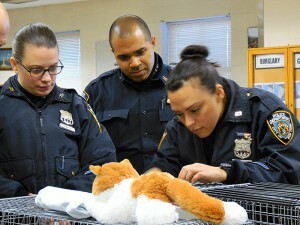 As a result, several officers at the 33rd Precinct gained a new understanding about community cats and Officer Stoll became very receptive to the idea of the NYCFCI holding a TNR workshop at the precinct. A few weeks before the workshop, Kathleen addressed the Precinct Community Council meeting to briefly explain TNR and to invite people to attend. 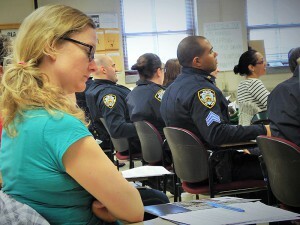 The workshop presented a unique opportunity, said Kathleen, to “foster a better understanding between community cat caretakers and the NYPD.” Members of the force assigned to the 19th, 23rd, 25th, 28th, 30th, 32nd, and 33rd precincts attended. As Kathleen explained to the workshop’s “civilian” participants, “Even if they don’t go forth and do TNR themselves, the police are learning about the process of TNR, the behavior of community cats, and the challenges faced by their caretakers.” All of which, she pointed out, is bound to make them, and their precincts, stronger supporters of the caretakers and their efforts. Officer Stoll added that the officers were taking the workshop on their own time and that had each taken on the role as Animal Cruelty Liaison for his or her precinct. At the end of the three-hour workshop, the two-dozen attendees became the area’s newest Certified TNR Caretakers. The host precinct, however, has evidently been caring for at least one cat for a while — an orange male cat has taken up residence on the premises.